We live in times when more than one billion women, or one in three women, around the world do not have access to safe sanitation while one in ten women do not have access to clean water. Today dirty water kills more women than cancer. Half of India's 445 rivers are too polluted for drinking. Presently the richest one percent of the world own more than the rest of humanity combined. A Mumbai-based medical second opinion services centre has revealed that 44 percent of suggested surgeries were needless. One third of the food produced in the world is wasted while 870 million go to bed without food everyday. Indiscriminate human action is showing up as environmental crisis like never before, and technology and globalization has made us so interconnected that acts of avarice in one corner of the world seems to affect the poor man in the other. This does seem to be a real pickle we have got ourselves into. We generally tend to look for new solutions for new crises, and in the process we create new issues. Any reference to values, austerities or spirituality as solutions is often mocked at as regressive. In a sense it is not completely right to blame the younger generation for such contempt, for what has been lacking is the presenting of this time-tested wisdom in the modern context. We do teach our children that the solution for all problems lies in Bhagawan's message, but what we need to do is help them see that message in the background of the modern day happenings. And that is where the works and writings of Prof. G. Venkataraman have always stood out. With his immense knowledge of history and current affairs, and his passion to highlight the relevance of Bhagawan's message in this time and age and for the future, his writings always make for inspiring and interesting reading. If we were to define in one phrase the problem we face in the world today, we could probably say 'decline in Dharma' – Dharma being a word pregnant with meaning and wisdom. No wonder Bhagawan wrote an entire book explaining this one value. 'Dharma Vahini', which was a series of articles written by Bhagawan for the Sanathana Sarathi and later compiled into a book, describes and dilates on the various nuances of Dharma. And Prof. Venkataraman's musings series on this Vahini presents in modern context this wonderful book's timeless wisdom. This series is the transcript with illustrations of the musings series aired on Radio Sai in 2007-08. You can look forward to a new part of this series on the 13th of every month. This too is part of the Radio Sai offerings for the 90th year of the Divine Advent. For how can the celebration of the life of our Divine Master be complete without a sincere study of His message. So let us with prayers, join Prof. Venkataraman in this journey through the Dharma Vahini. Presented below is the second part of the series. Loving Sai Ram and greetings from Prasanthi Nilayam. We resume our study of Swami’s Dharma Vahini, one of the most important books ever written. I do hope you remember the history of this book. For the benefit of those who are reading this article but have not read the first part of the series, let me say once more that Dharma Vahini is a book based on a series of articles first written by Swami for Sanathana Sarathi, a long time ago. These articles put together points made by Swami in His various Discourses, focussing almost entirely on Dharma and its vital importance, not only to the individual but to humanity as a whole. The present series is based on Prof. Kasturi’s English translation. Instead of merely reading out the book from cover to cover, I thought it would be more appropriate for the times, especially for young listeners and those who have come to Swami very recently, if I focussed on just a few critical passages, and helped you to absorb these concepts. That is what I did last time and that exactly is what I plan to do in this as well as subsequent parts in this series. 1. Adherence to Dharma is a must if we want peace in our individual lives as well as in humanity as a whole. If we fail to ensure the observance of Dharma in every activity of our lives, no matter how small or insignificant it might seem, we would be rewarded with troubles, turbulence, conflict and even gory violence, sometimes quite extensive and on a large scale. 2. Dharma should not be interpreted narrowly as righteous actions only, as we often tend to. Yes, at a certain level, Dharma does boil down to righteous action; no question about that. That said, it must never be forgotten that Dharma is verily God! So following Dharma really means we are following God, all the way! 3. All this has been known for thousands of years; yet we find that even as humanity is making staggering progress in science and technology, where human behaviour is concerned, we seem to be degenerating with alarming rapidity! Why is this happening? Why is it that even as our so-called knowledge is supposed to be advancing, we are becoming more and more blind to the need to sustain Dharma? The answer is simple, and Swami has stated it very clearly. He says that as technology begins to offer more and more distractions, we become not only more and more engrossed in these superficial attractions, but also increasingly attached to gadgets and the like. For example, fifteen years ago, the mobile or cell phone was hardly known; but now, even children have them, millions and millions of them. Indeed lives seem to be increasingly cell-phone and internet driven. In short, attachment to the external world very efficiently and successfully eclipses Dharma, and priorities we need to have in life. 4. The final point I made in the last talk, quoting Swami of course, is that life is given to us to realise our true Nature as the Atma and that we are not the body. The body is merely a dress worn temporarily by the Atma for the purpose of existing briefly on earth. This realisation would fail to dawn if, thanks to delusions, we keep chasing false reality all the time. However, if we stick to Dharma all the way, the scales would drop from our eyes, and we would become conscious of our True Nature. In all worldly activities, you should be careful not to offend propriety, or the canons of good nature. You should not play false to the promptings of the Inner Voice, and you should be prepared at all times to respect the appropriate dictates of Conscience. You should watch your steps to see whether you are in someone else’s way. You must be ever vigilant to discover the Truth, behind all this scintillating variety. This is your entire Duty, O Man, and this really is what your Dharma is. A very good and pertinent question; luckily for us, Swami has explained all this to His students, in fact many times. All that I have to do is to draw upon that treasure. This is typically the way the inner debate starts off. I do not want to sketch out the entire debate but would instead like to identify the two principal voices that one generally hears in all such internal debates. To put it simply, one is the voice of the Head and the other is the Voice of the Heart or Conscience. The question now becomes: How do we distinguish between the two? Swami has given the answer. Basically, the Head gives suggestions/answers which have their roots in ego and body-consciousness. At the practical level, these answers would have a strong flavour of attachment, greed, selfishness, self-interest, sense gratification etc. So if we check out the so-called voice and we find that traces of these elements are indeed present, then we know for sure that the source of this voice is body consciousness or ego, and therefore ought to be scrupulously avoided. What about the other voice, the Voice of Conscience? Well, being essentially the Voice of God, it would be full of selfless love, compassion, totally free from self-interest, anger, jealousy, hate etc. Thus by applying this litmus test, it is easy to discriminate amongst the different answers we get from within and pick that which is the true Voice of Conscience, as opposed to the impostors. I hope that is clear. To put it all in simple words, for an action to be Dharmic, it must be free of attachment, it must not come in the way of others, it must be totally selfless, it must be filled with pure love, etc. As long as we do not forget these basic criteria, deciding whether an action is Dharmic or not is quite easy to determine. It is a different matter to summon the willpower required to perform such an action, for often it would call for sacrifices that most of us would not be ready for. That indeed is often the problem! The blazing fire of Jnana, which convinces you that all this is God, will consume into ashes all traces of your egoism and worldly attachment. You must become intoxicated with the nectar of Union with God; that is the ultimate goal of Dharma, and of Karma inspired by Dharma. “Sacrifice ignorance and ego at the altar of Jnana or Spiritual Wisdom, and install Dharma therein” - this is the message of the Vedas. Every single unselfish act, which prepares the ground for the merging of the individual Soul with the Universal Soul or the Atma, which enables you to see God everywhere, is a Dharmic act. Whatever is done in an attitude of dedication and surrender is a component of the Dharma, which leads to Realisation. The strategy of the Bharathiya way of life is directed towards the sanctification of every moment and every word, thought and deed, into a step towards the realisation. The message is loud and clear; for an action to be truly called Dharmic, it must aid and assist in some manner or the other, the doer of the action to see God everywhere; in turn, it means that while performing the action, the person concerned must be suffused with the Atmic feeling or Atma Bhavam as Swami often puts it. I agree that people have not said so in public or in their writings, but I have been asked questions along these lines by many, including by people whom I hold in high esteem. I think it is necessary to offer a few clarifying remarks to place all this in the proper perspective. First and foremost, Swami is not heaping praise on ancient Indian Culture because it is Indian or even Hindu. 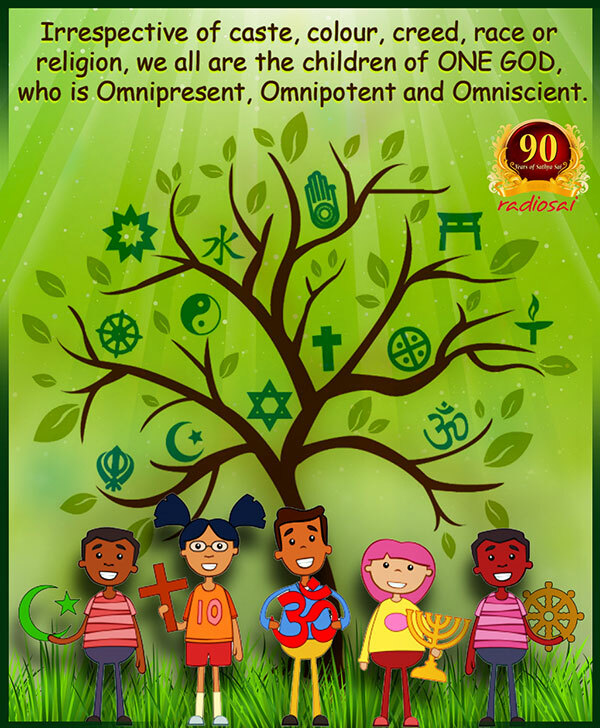 He extols it because of the enormous importance given to the fact that humans are primarily Divine in nature and they all are, irrespective of caste, colour, creed, race or religion, the children of one God who is omnipresent. Many Americans have told me that in their early days they were disturbed to hear their local pastor declare that those who did not believe in Jesus were doomed to spend their life after death in hell. These people said to me, “I was disturbed because I could not understand two things. Firstly, what happened before Christ appeared on the scene; secondly, I wanted to know if God created everything in the Universe, then He obviously also created those who profess other faiths such as Islam or Judaism or whatever. How then could God be so partial to Christians?” And you know what? All these people also told me that every single doubt of theirs was answered, the moment they came to Swami and heard what He had to say. Swami told them, there is only one God and He is God for all without exception. Further, this God is Omnipresent, Omnipotent and Omniscient. The practices of today and the principles of yesterday are far apart. Even the smallest detail of secular life has to be inspired by the higher ideal of spiritual fulfilment. Then even simple folk can be led step by step towards the goal. When you do not discriminate the process and the purpose of every act, but still go on doing it, it becomes a funny fossilised version. Now this is an important piece of advice. Why? Because it explicitly calls our attention to how much modern life has, in the name of secularism, drifted away from eternal moral values. By the way, Swami said this way back in the sixties or so. Today, as we march forward in the 21st century, things have become far worse; this is something we had better keep in mind, while trying to absorb what Swami says. RULE 1: Make sure every action, no matter how trivial and small it might seem, it is tuned to the higher ideal of spiritual fulfilment. RULE 2: We must also make sure that before we do anything, we analyse the nature of the action. In practical terms, we ask many questions and apply some acid tests – this is what discrimination really boils down to. It is only when the contemplated action passes all these checks and tests, that we accept it as doable and in conformity with the goal of spiritual upliftment.
. Is the proposed action good or bad?
. Is there any trace of selfishness or is it totally selfless?
. Will it in any way harm any person or even a creature?
. Will it on the other hand benefit any person or creature?
. Is it saturated with Pure Love?
. Will it make people involved happy and fill them with bliss? Dharma cannot be restricted to any particular society or nation, for it is closely bound up with the fortunes of the entire living world. It is a flame of light that can never be extinguished. It is untrammelled in its beneficent action. Krishna taught the Gita to Arjuna. But He intended it for the whole of humanity. Arjuna was just an excuse. That very Gita is today correcting all mankind. It is not for any particular caste, religion or nation. It is the very breath for humans everywhere. I hope you paid careful attention to that quote. We need to digest that slowly, and so I shall reserve comments on that for the next part. Meanwhile I do hope you were able to follow what I have been trying to tell you. Thank you for your patience. God bless, and Jai Sai Ram.